Brunch’s can vary per person’s taste, it could include delicious sticky-sweet pancakes, spicy Mexican chilaquiles, or grilled steak with poached eggs. Whichever direction you favor, brunch is a leisurely meal and the perfect opportunity to pour a glass of Champagne or share a bottle of wine with friends. These pairings cover a number of brunch dishes and styles you’re likely to encounter on weekends. Moet & Chandon White Star ($35), an elegant sip and yet not so esteemed that dressing it down with a splash or two of fresh blood-orange juice would be out of the question. Childress Vineyards‘ 2005 Barrel Select Chardonnay ($15), which is buttery but lively and refreshing. Gundlach Bundschu‘s 2004 merlot from Sonoma’s Rhinefarm Vineyard ($30), which has flavors of black cherry, green pepper, and minerals balanced on a spine of acidity. Because the light, sweet-tart playfulness of the grape Viura (from which most white Riojas are made or blended) is just right for the salt and smoke of a good ham and for the nutty, tannic quality of a redeye gravy made with strong coffee. We like the Rioja Blanco 2006 ($8) produced by Marques de Caceres. Its bright notes of green apple and ripe peach add a distinct, sunny dimension to this darkly savory dish. Rosemount Estate GSM (Grenache, Syrah, Mourvedre) 2003 McLaren Vale ($25). It has just the right amount of spice to add nuance to the black fruit and vanilla, as well as a robust, attention-grabbing texture. Because the heat of chiles, coupled with the mellow flavors of corn tortilla and egg, typify brunches inspired by Mexican or Southwestern dishes. The red-berry juiciness of the Gamay grape draws out the fruitiness in chiles, while the chilled wine cools their heat. We like the plummy, black-peppery palate of Michel Tete’s 2005 Julienas from Domaine du Clos du Fief ($21), which offers a knockout match. Marchesi di Gresys 2006 La Serra Moscato d’Asti ($16), with its honeyed, nutty nuances. Royal Tokaji Wine Company’s 2005 Furmint ($14) because it has a firm lemon-lime character on the palate and aromas of green herbs, which conjure the dill and chives that typically garnish smoked salmon. Zardetto Prosecco di Conegliano Brut NV ($11), which has appetizing, complementary aromas of bread dough and apples. serving, but they will also love the wine pairing! 2. Always use coupe Champagne glasses (retro rounded saucer cups), not flutes. All of the coupe glasses in the tower should be identical. Most party rental places will have coupe glasses on hand for weddings or events. 3. The tower is essentially made up of successively smaller layers of squares. For example, if the bottom layer is 10 glasses by 10 glasses, the layer above that would be nine by nine, the layer above that eight by eight, and so on. 4. Make sure each glass touches the surrounding glasses. When done right, you’ll see a diamond-shaped gap between each glass. 5. When building the next layer, center the stem of the glass over the diamond openings that were created by the layer below. Gingerly fill in the layer with glasses. 6. Repeat this assembly process until there is a single coupe glass on top. 7. Once fully assembled, begin slowly pouring Champagne from the the top glass and it will trickle downward. Larger-size Champagne bottles or magnums work best here. 8. If you’re using the tower for decorative purposes only, assemble and fill with Champagne before the celebration. Then have trays filled with fresh Champagne at the base or passed to your guests. Be ready to WOW your guests as they view your featured Champagne Tower! 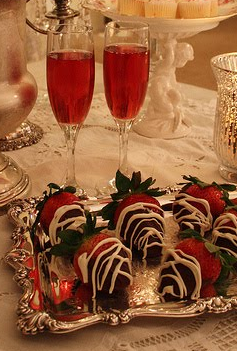 Do you have any other creative Champagne Party ideas you would like to share with us? Please post a comment below and share the bubbly love. Top off with some great-tasting Rose, such as Piper-Hiedsieck‘s Rose Sauvage. Who said chocolate covered strawberries can’t be enjoyed in liquid form? Introducing a very smooth rendition of the most orgasmic dessert ever. Umm, can I have about about a dozen of these? Whew, why am I not buzzed yet from just writing about these bubbly wonders? Definitely can’t wait to try them out this Summer! Pour vodka into an ice-filled glass and top with ginger ale. Garnish with a piece of crystalized ginger and a black raspberry. Shake vodka and mango nectar with ice and strain into a chilled martini glass. Top with Champagne. Finish with a mango slice and a black raspberry. You can smell the berries from here & it’s delicious. Try this natural black raspberry that meets french vodka cocktail recipe. If you are only serving a few glasses of Champagne, it is easiest to tilt the glass first, as you would when pouring a beer, so that when you pour it, the glass doesn’t overflow with froth. But if you are pouring Champagne for a big party, it is best to first pour a little of bubbly into each glass, to fill by one-third; then as soon as the froth has died down, top up the glasses. If it looks as if the foam will shoot over the top of the glass, quickly put your finger in the middle of the foam or dip the end of a teaspoon handle in the middle. Champagne always tastes best well chilled, but the exact temperature for chilling is a matter of personal taste. Three to four hours in the refrigerator is fine, or if you are caught unprepared, a 30 minute blast in the freezer will do the trick. 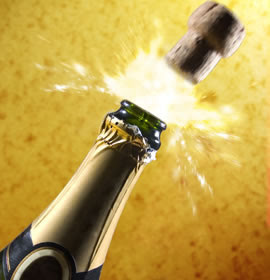 A word of cautionary advice; don’t forget about the bottle in the freezer – if the bubbles freeze, the cork will shoot out and quite possibly the bottle will explode – I know, I’ve done it! If you are using an ice bucket, ice mixed with water will cool the bubbles much faster than ice alone. Chilling Champagne helps reduce the pressure inside the bottle so that it is easier and safer to open, and there’s no wastage. Fresh, juicy peaches baked in delicious Champagne are a winning combination. They taste even better the next day when the flavors have fully developed. Cut the peaches in half and remove and discard the stones. Using a teaspoon , scoop out some of the flesh from the cavity in the peaches, then coarsely chop the bits. Put the chopped peaches, crushed ratafia biscuits, chopped almonds, and sugar in a bowl and mix well. Put the peach halves in a lightly buttered, shallow baking dish and fill the hollowed-out centers with the almond and peach mixture. Dot the tops with butter and pour the fizz over. Bake, uncovered, in a preheated oven at 350F for 35-40 minutes, until the peaches are soft and tender, but still retain their shape, and the liquid has become syrupy. Remove from the oven and let cool slightly. Serve warm, with a little of the syrup spooned over and lashings of whipped cream. Alternatively, cover with plastic wrap and chill overnight for the flavors to fully develop. Remove the chilled peaches from the refrigerator and let stand at room temperature for about 20 minutes before serving with the syrup and cream.